Information: Although Class A3 locomotives were introduced in 1928; the reality is that they were all re-builds of earlier A1 locomotives dating back to 1922. The locomotives were intended to replace the ageing Ivatt 4-4-2’s on the East Coast Mainline between London and Newcastle. One member of the class “Flying Scotsman” is with-out doubt the world’s best known steam locomotive and certainly the most traveled. Details: Class A3 locomotives were designed under the guidance of Sir Nigel Gresley, Chief Mechanical Engineer for the London North Eastern Railway (LNER). The class comprised a total of 79-members, most of which (52) were re-builds of the earlier Class A1 Pacifics. The class was designed to handle the ever increasing loads for express passenger service on the East Coast Mainline, replacing older Ivatt Atlantic class locomotives. The A3 design expanded on earlier success of the A1 class by introducing a super-heated boiler, changes to the valve gear, and revised cylinders. The changes were necessary to enable even longer non-stop runs after the grouping of former GNR into the newly formed London North Eastern Railway (LNER). The modification also changed the driver’s position over to the left-side in to provide better driver visibility of track signals. The biggest visible distinguishing feature between the two classes was the new “banjo dome” atop the boiler. To many eyes the result was one of the finest looking steam locomotive designs in Britain. The redesigned locomotives were capable of hauling the heavily loaded trains in excess of 100-mph. Members of the A1 class were all built with large 8-wheel tenders in order to cope with long non-stop workings. By 1928, while members of the class were being converted to class A3 specifications, 10-members were provided with a new corridor style tender. This design enabled non-stop running from London’s Kings Cross through to Edinburgh Waverly, a distance of 392-miles. Further improvements were made to members of the class through the 1950’s including a Kylchap chimney for improved exhaust and fitting of German style steam deflectors to rectify a deep rooted driver complaints concerning visibility. However, by the mid-1930’s the lessons learned from the top-link A1/A3’s were already being applied to the A4 design. 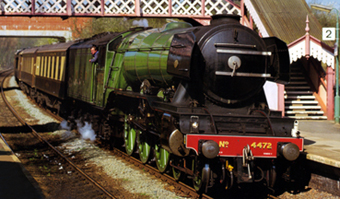 The locomotives, built in the LNER Doncaster works were all turned-out in lined LNER apple green livery. After nationalisation some members were repainted in the experimental Blue livery adopted by the newly formed British Railways. This colour was quickly superseded by the over-all British Railways Brunswick green lined livery that was maintained to the end. With their work being duplicated by new diesel designs, withdrawals began with 60104 Solario in 1959. Prince Palentine, 60052 was the last member to be withdrawn making it to January 1966. Only one member of the class was to survive the breakers torch; “Flying Scotsman”. Although a total of 79-Class A3 locomotives were built, the one member of the class that always comes to the fore-front for enthusiasts and non-enthusiasts alike; 4472 “Flying Scotsman”. The name chosen for the second A1 locomotive built in 1923 was to be taken from the name-sake train for which the class was designed to haul. By 1963 the decision was made by British Railways to with-draw “Flying Scotsman” which in turn was taken into private ownership by Alan Pegler. At that time there was no reason to believe that due to politics and business that “Flying Scotsman” was to become a world traveler. It was not unknown for key British locomotives to tour The United States prior to World War 2; but under private owner-ship “Flying Scotsman” toured the States and Canada on an extended trip during 1969 and 1970; where it became a financial burden to her owner. Parts of the train were eventually scrapped in the States. One feature of the train was the Pullman observation car that escaped the torch only to be repatriated with the home country in the 1980’s. By 1973 the locomotive “Flying Scotsman” was repatriated and after running many steam specials through-out Britain was soon to embark on another tour; this time Australia during 1988 and 1989. This world traveler has amassed over two-million miles during her life time. 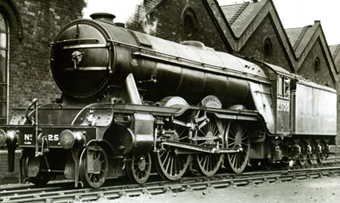 Finally in 2004 the decision was made to add the only A3 survivor to the National Railway Museum collection in York. At the time of writing the locomotive is under-going a thorough restoration process and will hopefully once again take to the mainline like the proud thorough-bred she is.